I recently changed to a Laser and am finding that what looks very simple from the outside is a bit complicated! I have been finding out loads from your cheat sheets and have a question: when you refer to inches in the table in the right column, what exactly are you measuring?? The settings are deceptively simple, really important, and are in inches (apologies to readers outside the US). Different people have very different settings - these are what work for me. Traveler refers to how high/low it is off your deck. As a general rule, you want the traveler to be as low as possible without affecting your steering. Lower is better, so a low-profile carbon tiller is a must. Vang tension is interesting because you use it to depower the rig when it's windy and to flatten the sail and let the boom out (not up) when it's light. 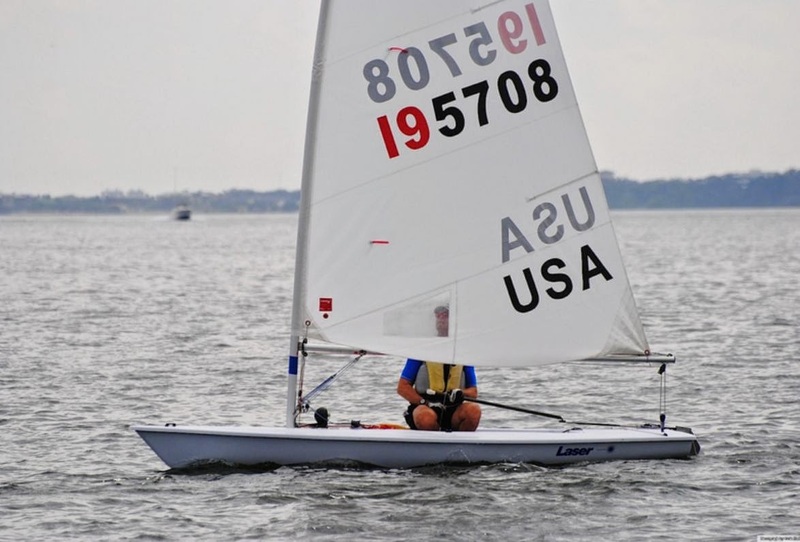 In medium conditions, I have no vang tension and control the sail with my mainsheet. 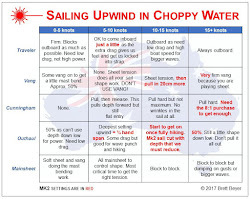 Cunningham (or downhaul) settings vary greatly. Some like "speed wrinkles" while others like it so tight that the bottom of the sail behind the mast is hard to read. 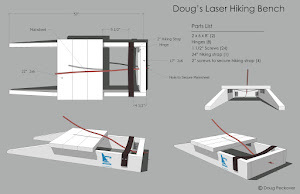 I rely on the Laser's good design and just pull the cunningham enough to get wrinkles out and then release it enough so that the sail is sensitive enough to read. When it's windy, some pull so tight that they have to set up the cunningham on one side of the boom to get it really low. Outhaul is a trick I learned from Steve Bourdow after he came second at the 1990 Open Worlds: put your thumb on the boom and then the tip of your pinkie should just touch the sail at its fullest part (this reminds Pam of the Hawaii hang loose sign). What I like about this measurement is that people with smaller hands tend to weigh less and therefore need a flatter setting. As the wind increases, you depower with a tighter outhaul. Mainsheet refers to the distance between the two mainsheet blocks at the back of the boat. I prefer to have a looser setting compared with most others. As the wind increases you want to get to block-to-block, but many do this way too soon. When it's really windy, you need to depower by letting the boom out (with a tight vang, the boom goes out instead of up). set for speed and not pointing (I won both races that day). Cunningham is let off as much as possible. Having it too tight in a breeze makes things unstable and may have cost me the 1999 Master Worlds. 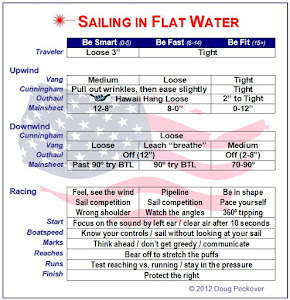 Vang downwind has many possible settings. A good general rule is to have it loose enough to have the leach move back and forth a little on its own. Most people have it too tight. Outhaul as measured from the middle of the boom to the fullest part of the sail. This tends to be really loose until it's windy. Mainsheet is tricky to get right. I try to sail by-the-lee whenever possible. If it's really windy, this means pulling the boom in as this also helps make things more stable.